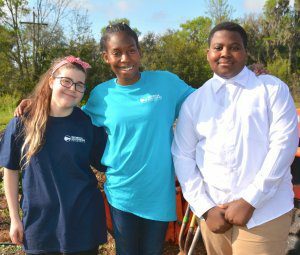 (SAVANNAH, GA) Students at Bethesda Academy, a residential and day school for boys in grades six through 12, are joining forces with chemistry students from Georgia Southern University – Armstrong Campus to try to answer questions on how gardening methods impact the nutritional value of produce. The research will focus on determining the antioxidant levels in food grown by three different methods: conventional soil-based cultivation using conventional fertilizers and pesticides, organic cultivation using sustainable, non-toxic processes and aquaponics, growing plants in fish tanks with a water-based system. Bethesda will offer the local organic testing ground and, in exchange, students will get the opportunity to engage with chemists in hands-on learning activities. 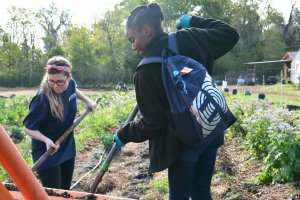 Miranda Smith, Biochemistry Student at Georgia Southern University (left) and Amari McDonald, Biochemistry Student at Georgia Southern University (right), work on the farm at Bethesda Academy. 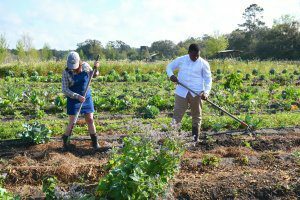 Merrin Slocombe, Director of Farm and Garden at Bethesda Academy (left) and Jakari Flowers, 10th Grade Student at Bethesda Academy (right) work on the farm at Bethesda Academy. The Bethesda campus is home to five-acres of organic gardens, including a large greenhouse. The school uses the facilities, as well as a cattle herd and pasture land, to teach vocational agriculture. 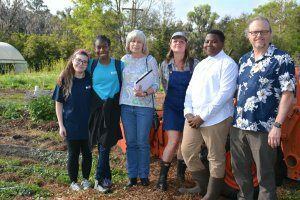 The school sells its produce at a farm stand open from 3-5 p.m. Thursdays.